Making Harmony With Fender Flare! Established in Chicago, IL in 1908, the Regal Company produced student and high quality custom instruments. They were one of the largest instrument manufacturers in the world from the 1930's thru the early 1950's. In 1954 the Regal trademark and company fixtures were sold to Harmony. Harmony & Kay, were the other major producers of "House Brand" instruments. 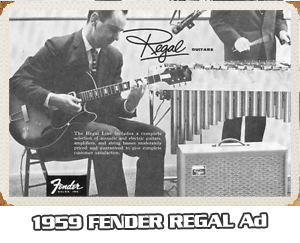 In an odd historical convergence, Regal guitars were licensed to a distribution deal with Fender in October of 1958. 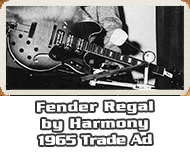 This licensing deal also carried a contractually "Re-branding Clause" that stated Harmony-built Regal Guitar were built specifically for Fender sale and would carry the Fender Logo. 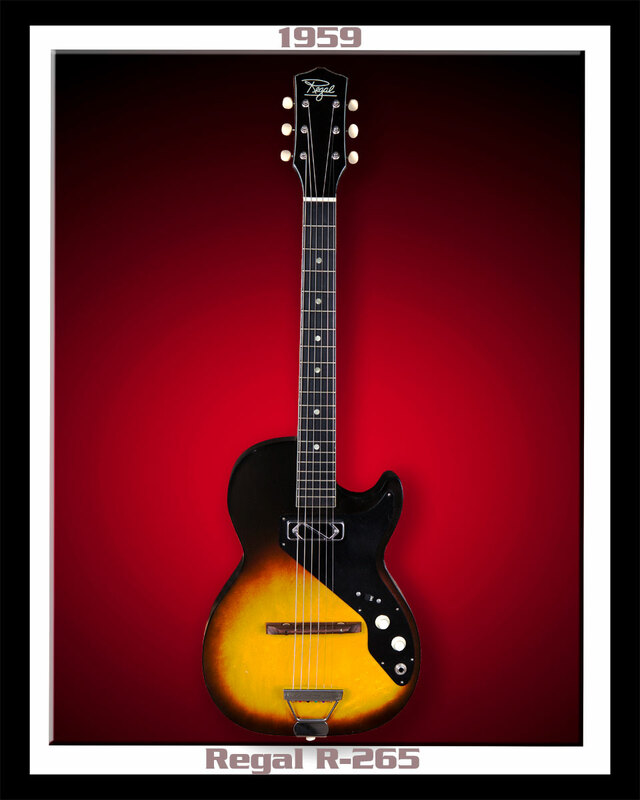 This licensing, along with the branding contract, continued until 1966, when Fender debut their Acoustic & Electric Hollow-Body line, such as the Coronado I and II, designed by Roger Rossmeisl. This Very RARE Regal Stratotone was made in USA by Harmony. The R-265 was quite unique in that Harmony never released the Regal Brand under Harmony's trademark name. 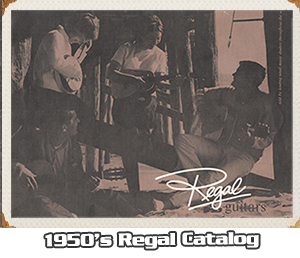 The Regal Brand was considered a "stand-alone" guitar line existing only as a Harmony subsidiary. This R-265 was one of the first hollow-body models that was distributed by Fender under this new licensing agreement. At the time, Fender only offered solid-body guitars and amplifiers. 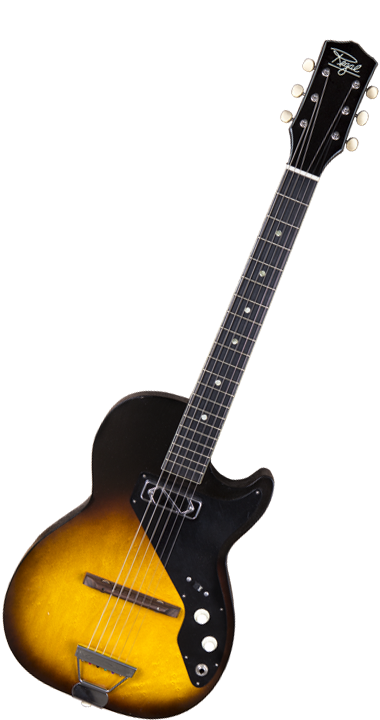 Several Regal acoustic and electric hollow-body models, like this Regal R-265, were added into the Fender sales line-up of 1959. These Regal Acoustic and Electric Hollow-Body models supplemented and widened the scope of Fender's 1959 guitar sales-push in a big way, by offering a more complete instrument catalog to the guitar buying public. Think of this Regal Stratotone as a 2nd cousin to its more famous and high-end Gibson and Fender relatives. The Regal Brand has risen into the top-tier of collectable American Guitar over the last few decades. With these hand-built guitars, there was never a need to sacrifice the Regal's endless tone and dynamics, especially equipped with that vintage Dearmond pickup... that’s why some of the best players in the world chose the Regal Brand.